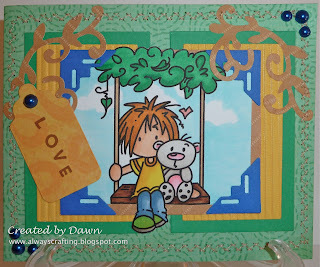 It is Paper playtime's Digital Monday time again and this weeks theme is Wedding or Love. So go on over to the blog here to check it out and enter your project! The queens have made some beautiful projects to show you! 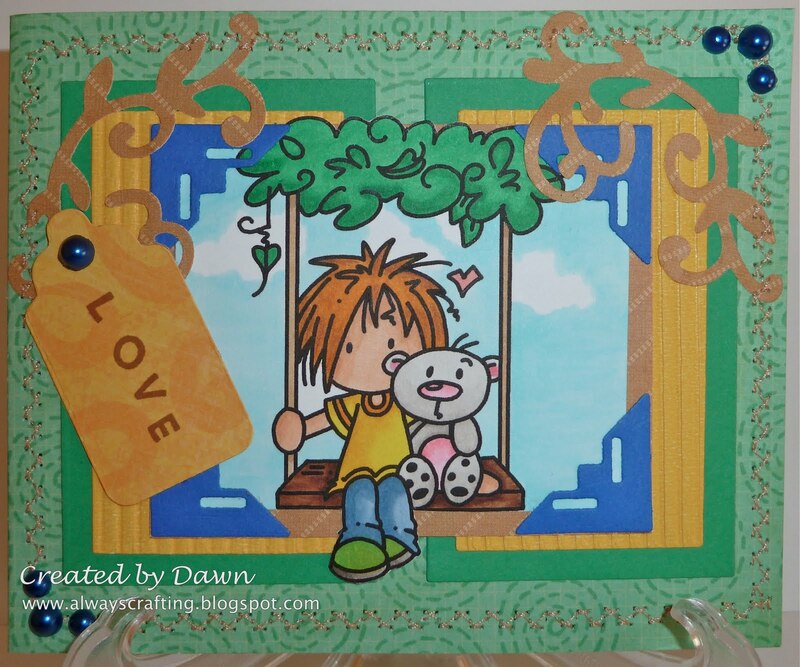 I made this card using Deacon Swing from Bugaboo Stamps which you can purchase here. This stamp is so sweet and one of my favorites. On this card I used K&Co. papers, Sizzix flourish die, Sizzix corners die, Sizzix scalloped tag and pearls. My next project is a gift bag using the Birds holding hearts by Pink Cat Studio that you can purchase here. For this project I used a Lifestyle Crafts paper bag die and using a spellbinders scallop rectangle die and spellbinders tag die I added handles to the bad. I made my pom pom flowers you can see how they are made here. 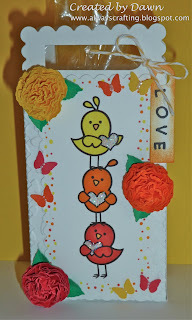 I added some butterflies using a Martha Stewart punch then the love tag is a spellbinders die tied on with Divine Twine in Lemon. Stickles crystal was added to the hearts held by the birds. See you over at the Paper Playtime blog! Dawn these are fabulous cards! Love the detail cutting with the boy on the swing in the first. You framed it beautifully with the corners. The second is a sweet gift bag! Love your flowers! Very cute. Thank you for joining us over at Do You Stack Up. Adorable cards! Fantastic layout on the Deacon card! Thanks for playing along with us at Catch the Bug! Fab card, love the image its really cute! Thank you for sharing with us at Craft Your Passion, good luck! cute cards! thanks for playing this weeks Bugaboo challenge at catch the bug! Ahhhh, what a cute little gift bag!! Super sweet. Thanks for joining us at FBD. Super cute....Fabulous card. Thanks for playing in this weeks challenge at Going Grey with Scrap-Creations! That is so cute, thanks for playing along with us at CCCB! darling! Thanks so much for joining us at CCCB! Great projects! Those little birds are adorable! Thanks for joining the Party this week and I hope to see more of your cards soon! Thanks for playing this week at 4 Crafty Chicks, nice card! Totally sweet and perfect for our cute and cuddly challenge! Thanks for joining us at Fab N Funky this week! Great cards. Love the bright colors you chose for the graduation card--and the way you enclosed the gift card. Thanks for playing in the Bugaboo Challenge. Fun cards. Thanks so much for joining us at Bugaboo this week. loving that sweet bird image soooo cute!! What darling cards! So glad you linked up at Craft Us Crazy! Love the card - the colours work so well together! Thanks for playing along with our Father's Day challenge at Craft Your Days Away.